Lola Pug and I are lucky to live close to not one, but TWO of her pug relatives, and we are happy to host them as our guests here at Casa Lola when their people go away. Now, usually, these visits fall so we only ever have one overnight guest at a time, but the stars were aligned in a more interesting way this week, and we had BOTH Nelly AND Roxy visiting us at the same time. As for their personalities, they really couldn’t be more different. 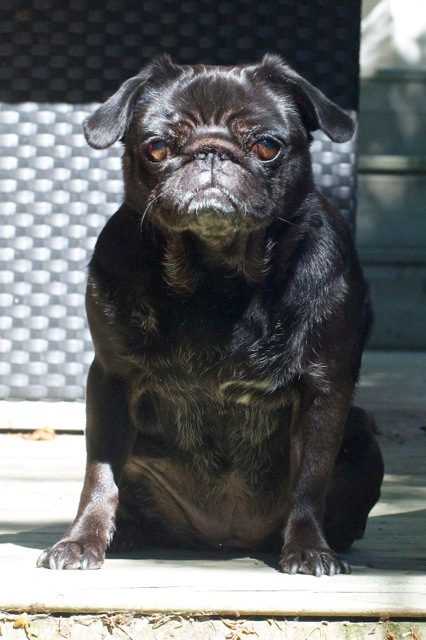 Lola Pug is the aloof and disapproving princess of the group – very discriminating about people and activities, and remarkably cranky at times. Roxy is the food-obsessed, happy adventurer of the three – always up for a dive into the dirt, and never without a tail wag for a new human or canine friend. And last, but not least, is Nelly – the pure soul – the eternally good-natured angel with a huge hit of dork about her. I think this photo kind of sums their personalities up quite nicely…. Roxy and Lola love Nelly, but I have caught them giving each other looks when Nells does something silly (which is quite often, believe me). As for Lola, she really does adore her family – but in small quantities, perhaps. She’s always happy to see them, and even happier when they leave. …which might be true about a lot of families, actually. And how did I fare having three pugs in the tiny space that is Casa Lola? 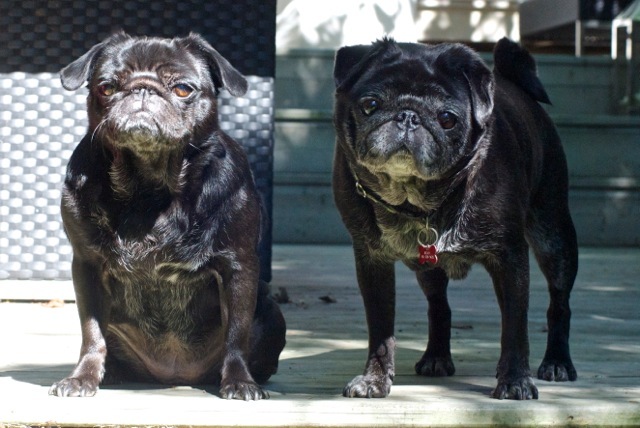 Well, let’s just say that people on the street smile at you when you’re walking one pug…they smile and laugh when you’re walking two pugs…and three pugs? They avoid eye contact with you at all cost. But the hit to my reputation as a semi-normal human being (oh, who am I kidding?) was worth it to have an actual, official “grumble” of pugs in my home. 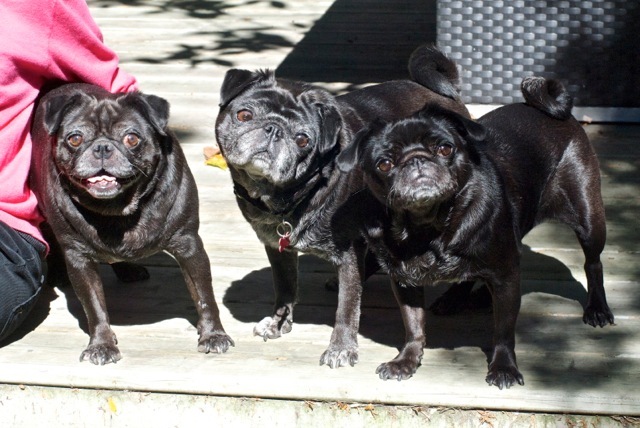 Does three count as enough for a grumble? And the family adventures continue on through this coming week. Wish me luck! I would certainly declare it a grumble! Lola has the most wonderful look on her face. I think she must be very much like me; you’re description of her fits, that’s for sure! 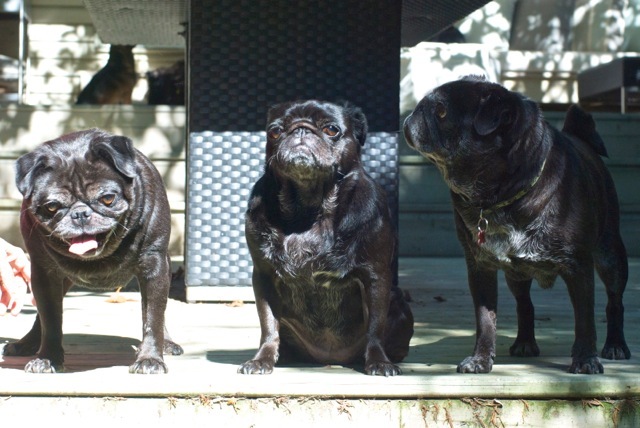 I love this blog, all the puggies so different from each other. Pugs are the best.